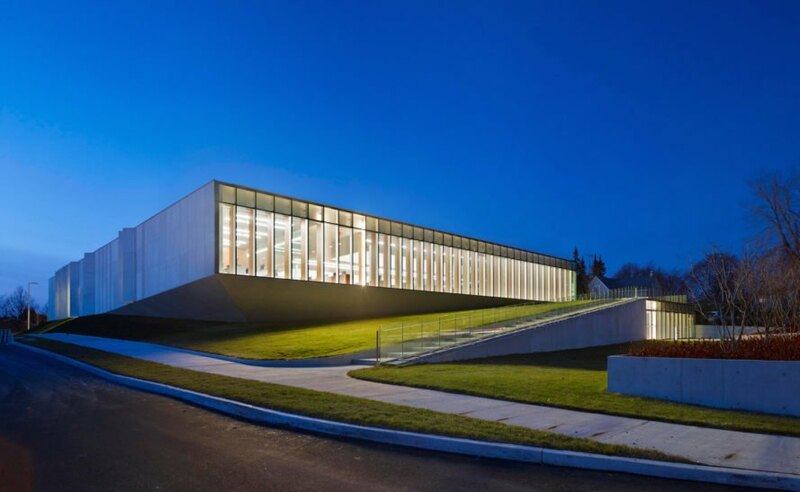 This gorgeous new library just an hour’s drive from downtown Toronto is a true civic center with its welcoming light-filled spaces nestled into a hillside. 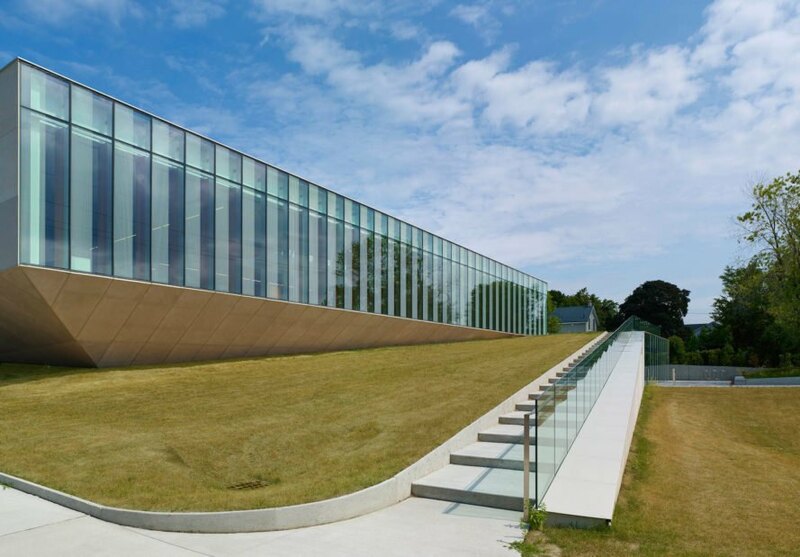 Canadian design firm RDHA recently completed the green-roofed Waterdown Library in Hamilton, built to replace a smaller municipal building and designed with a strong focus on sustainability. 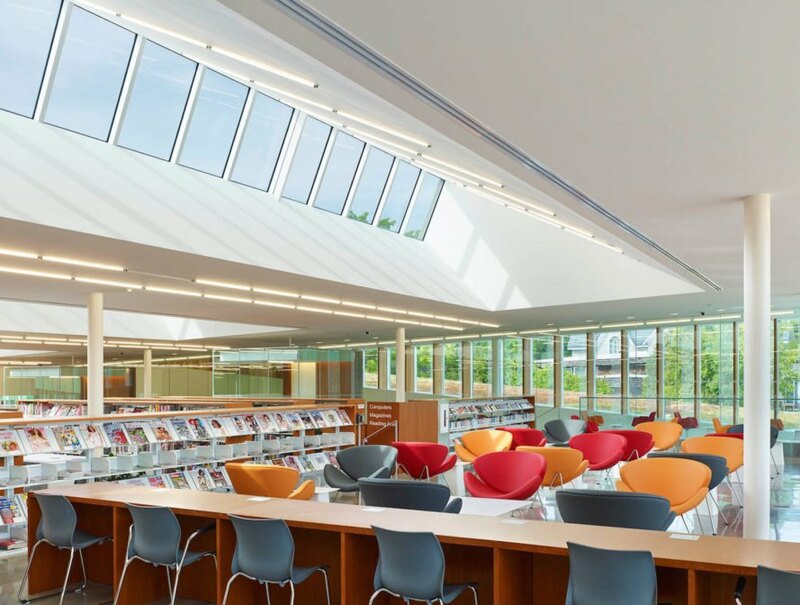 The new 23,500-square-foot building houses the traditional library functions as well as several other civic spaces including two community multipurpose rooms, the Waterdown Public Archive, a satellite municipal services outlet, a community information office, and police services. By nestling the library into the hillside, the architects disguise the library’s bulk and create a building that looks one-story from the exterior but actually contains six levels. The slab-like building cantilevers over ten feet towards the southwest to mimic the escarpment’s rocky outcrop. Floor-to-ceiling glazing wraps around the building to lessen the library’s monolithic appearance. The building is also clad in four-inch-thick locally quarried limestone panels and sixteen-foot-high solar fins. 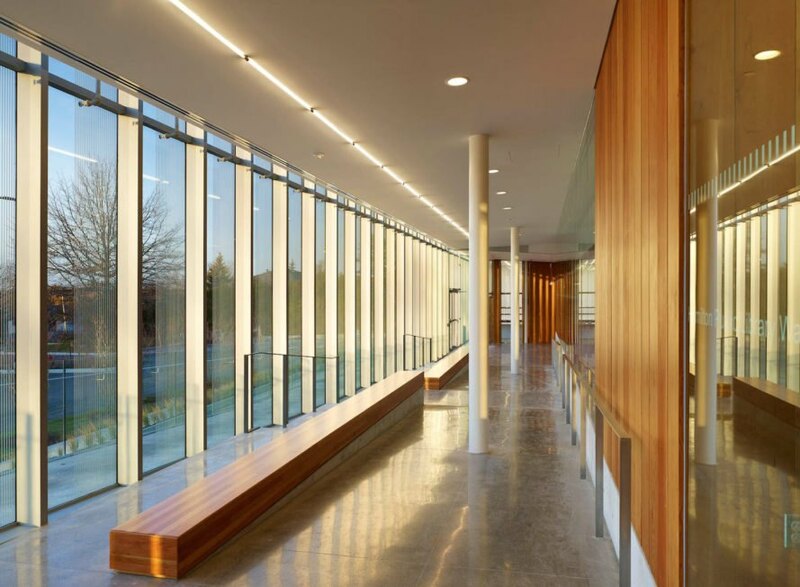 The library’s focus on energy efficiency begins with reliance on natural lighting thanks to the full-height glazing and sawtooth-style skylights. Solar heat gain is mitigated by the ceramic frit pattern on the double-glazed, argon-filled, low E-glass. Douglas fir used for solar shading and for interior cladding and furnishing was sourced from the demolished Hamilton Central Library. 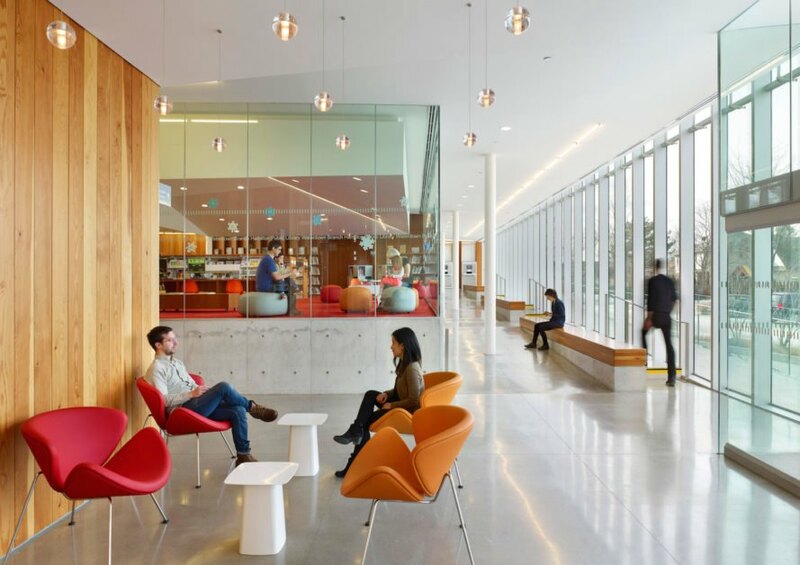 Recycled, low-VOC, and local materials are used throughout the building. A sloping green roof tops the library, while bioswales filter and funnel stormwater runoff into an underground rainwater collection system. 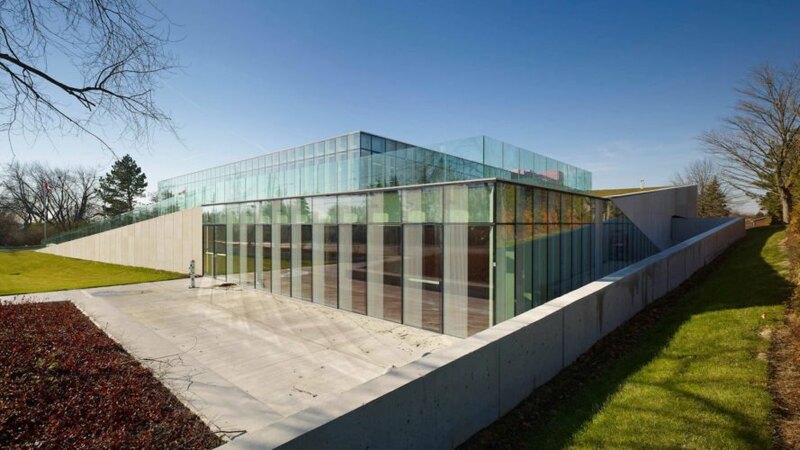 The Waterdown Library has become a major gathering place for the Hamilton community and the greater region, and has seen a 150 percent increase in visitor numbers compared to the old library it replaced. By nestling the library into the hillside, the architects disguise the library’s bulk and create a building that looks one-story from the exterior but actually contains six levels. The slab-like building cantilevers over ten feet towards the southwest to mimic the escarpment’s rocky outcrop. Floor-to-ceiling glazing wraps around the building to lessen the library’s monolithic appearance. The building is also clad in four-inch-thick locally quarried limestone panels and sixteen-foot-high solar fins. Solar heat gain is mitigated by the ceramic frit pattern on the double-glazed, argon-filled, low E-glass. Douglas fir used for solar shading and for interior cladding and furnishing was sourced from the demolished Hamilton Central Library.